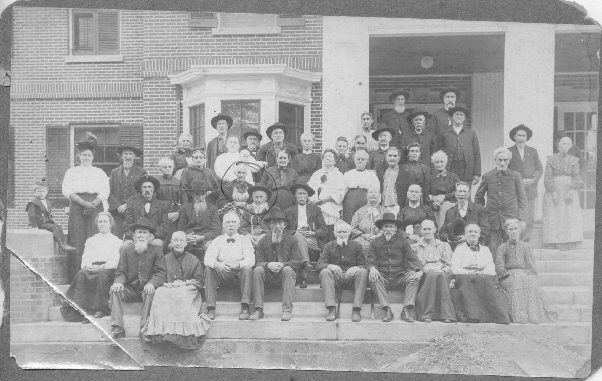 Photo submitted by Carol Walsh - Quincy, IL Soldiers Home. The couple circled in center is Sarah and Jim Williams from Pike county DATE OF PHOTO IS UNKNOWN - I have NO OTHER information on this photo. IL Soldiers & Sailors Home - The name was changed in June, 1973, to the "Illinois Veterans Home at Quincy" as it is known today. PREFACE: The Soldiers' and Sailors' Home was established by an act of the General Assembly, June 26, 1885, "to provide a home and subsistence for honorably discharged ex-soldiers and sailors who enlisted from Illinois in the U.S. Army or Navy, during the war of the rebellion and the Mexican War, and who have since become and are now residents of the State of Illinois, and who may have become disabled through. . . such service, or who by reason of old age, or other disabilites, are disqualified from earning a livelihood. . ."
The commission appointed by Governor Oglesby to locate the home under the provisions of this act, selected a tract of 140 acres just outside the northern limits of the city of Quincy. Building operations began in May, 1886. The home was formally opened in March, 1887. This book contains copies of pages from the Fourth, Fifth, Sixth, and Seventh Biennial Reports of the Board of Trustees and Officers of the Ilinois Soldiers' and Sailors' Home. Only those pages listing admissions to the Home were copied. Much additional data about the operation of the Home may be found in these reports. Copies of the full reports are in the Illinois State Library, Centennial Building, Springfield, Illinois 62756. Each Soldier or sailor was assigned a "Registry Number" upon admission to the Home. These numbers were assigned in consecutive order beginning with the number eleven. If a discharged veteran were later readmitted, he kept the number initially issued to him. Many names in these reports are obviously mis-spelled. A researcher should check the index for various spellings of a name. This volume covers 4,418 separate admissions to the Home between March, 1887. amd June 30, 1898. Many re-admissions are also noted. All of the men listed in this book served their country in the Mexican War or the Civil War. Beginning in 1899, Spanish-American War soldiers also became eligible to enter the Home. Projected future volumes of this series will include Spanish-American soldiers as well as veterans of the earlier wars. Mary Redmond and Christine Henderson, Research Librarians, Illinois State Library, have been especially helpful in the preparation of this publication. Below is the index from the book we have. Highlighted names have been transcribed - simply click on that name. If it has not been highlighted, contact Denise McLoughlin and request a transcription. BORTS, John M, Company A, 50th Illinois Infantry, Rank: Private, Amount of Monthly Pension: $24.00, Disability: Paralysis, Admitted from Adams County, Illinois on May 5, 1893. #2603 FIGLES, Martin, Company H, 1st Louisiana Infantry, Private, Length of Service: 12 Months, 66 Days, Amount of Monthly Pension: $12, Loss of Right Leg Below Knee, Admitted from Peoria County, Illinois on August 2, 1893.